A man was killed when he tried to escape being hit by a vehicles involved in a crash on Interstate 80. SOUTH HOLLAND, Ill. (WLS) -- Authorities have released details related to a crash that killed one person on Interstate 94 in the south suburbs Saturday. 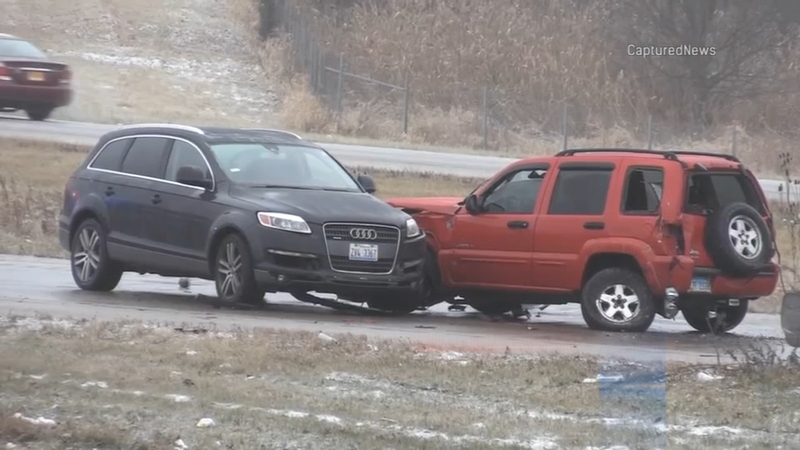 According to Illinois State Police, Manuel Juarez, 51, lost control of his vehicle due to icy road conditions on Southbound I-94 near 173rd Street. Juarez drove off the road and got out of his car after stopping. A second driver, Geovanda Walker, 63, then also lost control of her car on the ice. Juarez then helped her out of her vehicle. A third driver, Jesus Rivera-Medina, 36, also lost control of his car and hit a median barrier. Police said that Juarez went over the overpass at the time Rivera-Medina hit the barrier, but it is unclear why or how that fall happened. Juarez died from injuries caused by that fall. After Juarez fell, two more drivers, Michael Stewart, 36, and Lateasha Thomas, 27, lost control on the ice and hit the barrier and other stopped vehicles. Walker, Rivera-Medina and Thomas were all transported to the hospital following the accident.